As a friend lamented that the right-wing media and think tanks hadn’t covered the Venezuelan crisis as thoroughly as the “liberal” media, it dawned on me that while The New York Times, The Guardian, The Washington Post, NPR, PBS, and others had covered the conflict days after it began, the Wall Street Journal, Fox News, and others had fallen asleep at the wheel, becoming irrelevant in the process. Replacing the role of the media on the right was Senator Marco Rubio on the senate floor. The rather lazily-delivered speech was accessible on YouTube, and many shared it. The speech drew exhausted parallels between Venezuela and Cuba, and expounded upon the evils of the Castro brothers. Rubio also held a press conference with Florida’s Republican governor Rick Scott at a Venezuelan restaurant where Marco delivered the same message. In one fell swoop, Rubio campaigned for votes from Cubans and Venezuelans, for the senate and an inevitable future presidential run. No one took notice. While the reason that conservatives dropped the ball may be as simple as “the Wall Street Journal reporter was away,” much has changed in the way that information is collected, filtered and delivered. For one, social media has transformed access to the mainstream media. Whereas in 2004, only the highest spheres of power had access to the publishers of the New York Times, Washington Post, and others, today the middle class can write a reporter directly on twitter and other social media. They can also share the story on their Facebook accounts where a reporter may access it. Even with strict censorship, events iare no longer filtered through intermediaries who are often elites. With a burgeoning Venezuelan diaspora abroad which is educated and media savvy, events are now reported on different platforms. Photographs, videos, and articles are posted on Facebook and Twitter, re-posted, messages from emails, text, and whatsapp are sent and forwarded. The ready sharing and access to information shapes the story, broadening its characters and with them, its stakes. In 2004, the story was abstract. Venezuelans were at the mercy of how Juan Forero at The New York Times told it. Industry leaders panicked and implored their friends at The Wall Street Journal and Fox News for help. Ten years later, industry leaders have made their peace with the government. Yes, the government is repressive. Yes, there's panic. But is it a story for the Wall Street Journal? In 2014, the human rights angle of story feels urgent. Real humans are posting the videos of repression. When a story becomes real, when the critical mass of a country screams that it’s real, that’s when the so-called "liberal" media jumps in. As people started to die at protests, this wasn’t a story hatched in a think tank or a state department lab. Ordinary people were crying for help. The challenge was determining what was true. Whereas for years journalists had falsely portrayed the ongoing Venezuelan crisis as a conflict between the rich and the poor, in 2014 it was evident that the opposition had swollen to at least 50%. Those begging the media for coverage weren’t fancy Venezuelans at a cocktail party. They were waiters, store clerks, anyone with a computer. On March 1st, The New York Times rolled back down the hill with an article which once again attributes the crisis to class. 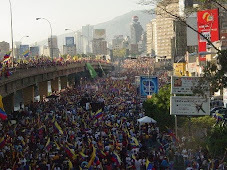 In "Slum Dwellers in Caracas Ask, What Protests? ", William Neumann falls short on important reasons why some of the poor in Caracas haven't joined the opposition protests, and also ignores evidence that many have. Because the world is in upheaval, it is imperative that the media scratch beneath the surface in areas of conflict. Simplifying the issue to class discontent ignores the institutional and structural reasons that landed Venezuela in a hole. Both Venezuela and the world deserve better. Apparently the Guardian reporter is unaware of anything that happened in Venezuela more than a month ago. That is all too common among US and European reports about Latin America. Anyone who has followed Venezuela via any of the three English language blogs would have predicted that if a poor neighborhood would erupt against Chavismo along with more affluent places, that protesting and poor neighborhood would have been Petare. Over six years ago, Petare voted against Chavismo in the December 2007 Constitutional Amendment Referendum. Today he[Hugo Chavez] reproached a room full of ardent supporters, of those that did vote for him, for not having helped remain and that because of them he would have to leave in 2013. In fact, he blamed them for letting the slums of Petare vote NO. And told them that they owed him. Can you say "resentment"? Can you speak to the wrong crowd? how bitter can one get? Caracas Chronicles pointed out that students worked together with Petare residents to vote against the Referendum. Surprisingly, the No even won in places like Petare, thanks to the efforts of the student movement and local politicians who have been trekking those cerros for years now. There should therefore be no surprise that in 2014, Petare and students once again were together. And even a dimwitted Gringo- a real Boludo- like myself knows that Chavismo used gerrymandering-- Hugomandering- against Petare for the 2010 legislative elections because it knew that Petare had turned oppo. Ignorant though the Guardian reporter may be, at least he is paying attention to Venezuela. Actually, I was a little slow- like a Boludo- in using your "search this blog" button. When I used Ixquick to document my memory, "petare gerrymandering" turned up my comment on your blog as the first hit! So I guess that makes me the international expert on gerrymandering in Petare. As my grandmother would state in her letters, "hah!" I again used Ixquick for "petare referendum" or some such, and came up with the above CC hit. Then I thought to myself, Daniel certainly covered this topic, so why don't I also find it on HIS blog. Then a light went on in my dim mind- "search this blog!" And that Hugo quote about "leaving in 2013" is priceless, as he ended up leaving in 2013 anyway even after he won the referendum the second time around. Sorry, but that first paragraph is ridiculous, and in fact may be just the opposite. There is little to respect in this guest columnist. It's written by someone with a political agenda,.....Sorry. Read it carefully: "As a friend lamented...", then read what Maria is actually saying: she is saying that the liberal media hadn't really reported anything effectively (or even truthfully) until the problems boiled over into violent street protest and deaths of 'normal' people occurred. The right wing media have been reporting for years the various problems, irregularities, economic woes, shortages, blackouts etc so their coverage seems muted now compared to what one would expect. The left-wing media are chicken running in circles screeching and trying to catch up, they are suddenly realising they have been fooled and wrong about Venezuela for years and years. You have to remember also that in the 2014/2004 comparison, in 2004 Facebook had just started, literally, Twitter unheard of and much social media a fraction of what it is today. The blogosphere was growing fast but nothing like now. Not at all. What she says is completely true. The only coverage on cable I have seen has been CNN. Fox has barely mentioned it between breaks of its ranting on about Obamacare. As for political agendas, come on. Name me any journalist or indeed any human being who doesn't have one. Sorry, but that's a stupid comment. I am sorry but only the WSJ has had some significant coverage, but less than other papers (I have re-tweeted stuff from the WSJ). As for FOX, if it did not happen in the US or to the US, or to a cute Panda bear it did not happen. OK, reductio ad absurdum but you will forgive me if one thinks that way. And when are anonymous stop being an anonymous or am I going to break down and erase ANY post that is not signed at least Joe? MSNBC has been the worst of the cable "news" networks. They've been too busy hyperventilating about some dumb bridge lane closures for the past two months to even mention what's happening in Venezuela. They barely even had time for Ukraine, either. Conclusion, don't waste your money buying and your time reading mainstream newspapers, buy an iPhone instead. The digital revolution on the march. Maybe we should create an app for Venezuelan blogs in English? The Internet is another matter. We are talking here what shows up on TV and front pages. I actually liked Rubios speech. This is a dumb article. Is this a dumb article BECAUSE she did not like Rubio speech (she dis not say she did not like it, she said that it was lazy and self serving which is not a direct translation into "I do not like it") or BECAUSE it is a dumb article? Please, be specific. I for one thought Rubio's speech at the Senate was good (I did not hear the one in El Arepazo) and I ALSO think that this is a great article. How come? Give me a break Daniel. Who is she to say that his speech is lazy and self serving. Venezuelans are reaching out to the world and and you are going to put down the one man who is trying to get momentum for action and embargos on the country. Not smart! She is allowed an opinion on Rubio's speech and me think that he is actually capable to take her criticism and do better next time. Assuming he reads it. 1) did it not register with you that I do not see Rubio's speech like Alex does and that I am not upset by our difference? 2) do you actually think that Rubio is going to get us out of the ditch? True, the speech was good, but as long as I do not see some action come out of it it is only comfort food of electoral purpose, on that I agree fully with Maria. No I don't necessarily think that his speech will get you out of the ditch. But would you rather have people like him or Tom Harkin? Perhaps if Rubio was in Kerry's shoes you actually would get some movement. You are getting ridiculous. It is not a matter of who I want, I have no impact on that, I do not vote in the US nor do I live there. I have to deal with what the US has in charge. Please, try to understand this when you comment on what I write about US politics. Let me remind you, of the sort term memory, that Bush was for 8 years in the White House and was arguably more hawkish than Rubio. Little good did that to Venezuela. If Rubio was of the Democratic party he would be hailed as a genius? Would it have been better for him to not have spoken out? Better for him not to be working with Menedez proposing sanctions? OK, I am getting tired of it. I know that Rubio is the great white GOP hope but this is not a blog about Rubio because 1) VN&V has a minority of readers that actually will vote on the US election and 2) those voters have probably made their mind already in an 80% which side they will vote. Finally! Criticism the way it should be! Thank you! Rubio was trying to make Hispanics conscious of the fact that Cuba is controlling Venezuela which is just basically sticking to the facts.If I have some ulterior motive or mixed motives to stick to the facts, it is still better than speculation on the bad motives of others only,thus confusing the issue.The Cuban / Venezuelan connection heightens the interest among the Hispanics, who otherwise might pay little attention.Conservatives in general are also more likely to take interest when hearing that Communist Cuba is extending its influence in Latin America. Also I think people here in the US are more worried about Obamacare and domestic issues than about foreign issues in general,and that is the more likely explanation for both Conservative and Liberals.In Europe there is also a focus on Eurozone economic problems and of course Ukraine. Daniel, you're welcome. I've only known about your blog for about a month now so I don't know what you wrote in the past. Please put up a link to your exposé of Mansueti. Conservatives are too busy staining their drawers over Islam to worry about communism or Cuba anymore. I'm happy to work with them to protect gun rights but they can be frustrating sometimes. 1. Attacking Conservatives does not win more people over to support or be sympathetic to Venezuela, in the same way that attacking Liberals doesn't either.This is a blog on Venezuela, not on US politics. 2, Conservatives are concerned with any threat to the US which is why Rubio appealed to that factor.I think he knows his base better than a Liberal would. I did not know about Mansuetti. What I am talking about is stuff that I have written several times during the 2012-2013 electoral cycle which are pretty much what Mansuetti writes about. The point here is that neither I or Mansuetti are originals, we just saw thing the way they were. First of all Maria I don't know how old you are, but my guess is that you are young enough to be my great granddaughter.I deduce this from the lack of depth and experience that shines through your oft times, parroted message from many of the US Liberals:' Liberals good, Conservatives bad'. It seems as those you are projecting your own lazy thinking onto others here when you refer to Rubio's speech as lazy. You demonize those who are different from you, attributing them evil, corporate ,self -interested motives, while insinuating that others who think like you have only the best intentions, including the Liberal CORPORATE media which is actually much more extensive and powerful than the Conservative one. That being said I am not a Conservative,but I do think there is a dangerous trend among certain " Liberals" to accept the basic premise of Chavisimo.It should not be all about class warfare it should be about understanding between classes,and empowering people to see themselves as human beings first ,and class second. I do not see how in anyway your insistence on the Liberals in the US being owners of the enlightened truth does any good whatsoever for the Venezuelan cause, but it does seem like a excuse for self -Justification and self- advertisement. Your bottom message: " I am right, they are wrong." As you grow in years and experience , and If you allow yourself to mature in depth,you will stop seeing the world in such a simplistic way. There are far deeper and more important messages to get out than this one. Firepig[ette] a.k.a. coche de fuego, give Alex a break, as last I knew she was living in Noo Yawk City doing the playwright thing. Both she and my cousins are linked to the NYC art community.Compared to some of the pronouncements of my NYC cousins, I image that Alex can come off as a flaming right winger. [ though as the mate of one of my cousins sells a fair amount of hie stuff to Republican businessmen, he is willing to somewhat temper his statements- at times.We hate them Pubs , but we sure like their money. You know the drill.] There is INCREDIBLE pressure in the NYC art community to take far left stances. I would be of the opinion that Alex withstands that pressure to at least to a certain degree. When Alex had her blog up- which I believe she shut down or cut off access to because of threats to her- I recall that she made rather sensible statements. He he, I am sure what you say is quite true, but my take on that is that it makes it even more important to stop the parroting. I have had first hand experience with this kind of pressure , believe me. Back in the 60's I studied fine arts in a very Liberal art school.Most of the teachers were flaming Liberals, though some just had a dull glow.In any case most of them made quite sure that talent was not linked to success...it was how well you linked your " art" to Liberal politics that made the difference. I had to laugh at them though when one of my closest friends was kicked out of the photography department for that very reason, and then 5 years later had worked her way up the head of the photography Department of ABC television. There are so many artists out there with questionable talent, and even more questionable discernment and whose success is a reflection of that particular kind of social injustice. I am not questioning this ladies talent...I don't know her, but I would like her to think twice about the implications of her message. Rubios senate speech was heated and personal from his heart. And even the most cynical liberal on the internet trying to bash anyone on the right should know it is his job to "represent" the people of his state. So if nothing else he was serving his public with their sentiments. The news in the US is 90% liberal, much like other "liberal utopias", ABC, NC, CBS, CNN, MSNBC, TME, newsweek, NYTime, Chicago tribune, LAtimes, Wash Post, Bravo, MTV Univision....ETC. All liberal and taking their marching orders from the US dictator Obama. All working in time with each other to make sure Hillary is president next. And that means don;t cover Rubio or any situation where he may become popular with any minority voter. Right now somewhere in the US democrats who admire Chavez and castro are digging for an angle or story to slander rubio. The only people the current leftists in the US see as enemies are Republicans. Chavista, Terrorism, Job, Economy all less important than staying in power.....Just like venezuela. Socialism > Communism is a script...You are in act 3, we are in act 2. The only way I can read this is as a satire. WaPo and the Tribune Company are liberal? That is funny, but not at all factual. I do not think Rubio's speech was lazy if anything at least someone is telling the truth. Lazy was Harking. Harkin was very lazy. Extremely, and intellectually dishonest to boot. Alex is not defending herself right now, probably busy in her video translating activities. So I am going to stick my head out for her and say that what she meant by "lazy" was taking easy shots on Maduro and Castro against Harkin for electoral purposes. That does not mean they are not valid, far from it. That means that Rubio will speak as loud against Maduro as his political interests are served. Ripping on Rubio, who clearly has come out as a friend of the Venezuelan opposition reminds me of the people who say they don't like the Venezuelan government, but find the guarimbas too much of an obstacle. I am getting sooooooooo tiiiiired.... NOBODY has ever claimed that Rubio was not a friend of Venezuelan opposition. Stop the paranoia and stop being lazy and signing anonymous. How convenient to bash this blog behind an anonymous...... Rubio deserves better supporters! Daniel, Rubio is surely anti-socialist, and his current stance may appear to be supportive of the opposition, but when chavismo falls, he will soon show his true colors as a wholly-owned subsidiary of the international banking and petroleum sectors. He is strongly anti-environmental protection, anti-regulation(health and safety), highly pro-business and and deeply involved with the Republican campaign in the US to restrict voting and civil rights. He is a friend of business and power, not of democracy, especially when democracy works in favor of the ordinary working person. At best, accept his help as a the useful idiot he is, but never trust him to be a true friend of democracy. What Republican campaign to restrict voting rights? There are some on the far left in the US who love Chavez and Maduro but they are not popular with the mainstream left. The problem that I see is that the far left is many of the "Liberals" and Liberals are disappearing rapidly ,and being replaced by soldiers for the Zombie Apocalypse.